If you paid attention to the Vice-Presidential debate during last year's election, you probably heard the mini-controversy about Gwen Ifill's moderating it. 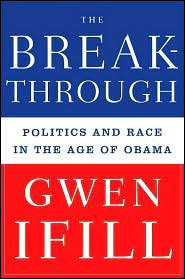 It was known that her next book would be titled The Breakthrough: Politics and Race in the Age of Obama. Conservative commentators suggested it made her a ruthless partisan who would exploit Sarah Palin. If they'd been given galleys of the book, they probably would not have worried. Ifill's book is neither revolutionary nor controversial. Even without the book, the controversy over her moderation proved meaningless. Only a whacko could have found Ifill's conduct advantageous to either side, while most of the country doubtless focused on Palin's inability to answer anything without resorting to a meaningless word salad of talking points and spastic winking. And, in any case, the title of Ifill's book is slightly misleading. The "Age of Obama" refers less to a coming reign or Pax Obamicana than it does to the concepts that his candidacy and victory embody. These preceded his candidacy and find expression in it, but they are by no means bound by his personality. Ifill instead focuses on black candidates who capture imaginations beyond the traditions of black political activism and harness new coalitions of voters that aren't hustled out by the old party figureheads. She not only profiles up-and-coming public figures but also examines the generational breakthroughs within the black political community and the interest-group struggles facing racial and gender-based activism. But what she has to say isn't unfamiliar to anyone who's been paying attention to race-based politics; it's just formatted more digestibly. Ifill doesn't present revelations so much as she re-presents the necessary evolutions of interest groups and their candidates. Newshounds of any racial background probably already understand the people involved and the process. This book synthesizes the experiences of both in an objective and unobjectionable survey. Those of us outside activist groups have a tendency to see them monolithically, having one program, one goal and often one frame of mind. There's a perception of a unity of focus. But Ifill notes that the candidacies of politicians like Cory Booker, Deval Patrick and Barack Obama have exposed generational divides in the black activist community, opening new debates on where to go from here. As Lewis articulates it, these generational problems are cyclical. The new generation pushes its way into power with a new program and new faces, then it morphs into the old guard, determined to hand over the levers of power almost on a seniority basis. To a certain extent, all political organizations work like this, wanting to reward their staunch long-time supporters and resenting new faces who are perceived to have "jumped the line." But these rules of succession are unavoidably more rigid within the black activist community. Consider: a white senator who doesn't "wait his turn" and instead attempts to usurp the presidential bid of someone who served under, say, Lyndon Johnson is perceived as being ambitious. But within the black political community, someone who jumps the line in front of someone who was agitating under the Johnson administration is someone who's trying to cut off a leader who might have been attacked on southern streets, persecuted by white sheriffs and blasted with firehoses from white firemen. In this case, the sense of paying ones dues is more real and more horrifying. But of course, sometimes the older generation hasn't the political capital or nuance to succeed where members of the younger generation might easily carry the day. Ifill describes these as "sandpaper" moments, where a gradual pulling apart suddenly gets impeded and then achieves enough force to break away, advancing farther than expected but with a grating movement. (I find the metaphor somewhat awkward and a little too patly applied at points, but it does describe how gradualism gets hindered within a group and can result in a shudder of movement that still retains the movement's character while changing its orientation.) The trouble then becomes how to mine the wisdom of elder leaders while also moving forward with more capable younger candidates and, most importantly, how to do this without marginalizing an elder leadership that sacrificed and endured more than any white politician can conceive. Both these criticisms can offend politicians and the black body politic dearly. After all, those early elected civil rights leaders were heroes: asserting that their achievements were undermined by the very nature of the achievements means stripping hopeful black Americans of their idols. Much the same is the case with dismissing marches and speeches from black churches as ineffective today. They might be ineffective now, but that dismissal can't help but seem like an attack on the power of the march to Selma or Martin Luther King Jr.'s speeches to so many black parishes in the south. The introduction of new tactics and new tacticians can't help but seem like both a repudiation and usurpation of a generation of civil rights leaders whose suffering was unique to political leaders in modern America. Another problem facing black community activists and candidates is the Us v. Them attitude engendered by any advance of one civil rights community compared to another. Probably nothing illustrated this concept better than the democratic primary showdown between Barack Obama and Hillary Clinton. Facing a discredited and demoralized republican party, the democrats stood a good chance of electing almost anyone they nominated. So who would break through? Women or African Americans? Despite the ugliness of these comments, Ifill's point isn't to spearhead a race to the bottom to prove which group is more victimized than the other but rather to highlight how even traditional civil-rights allies can clash when opportunity seems most in reach. Part of the problem of "breakthrough," as she describes it, is that the chance for it obscures the common interests of both groups. After all, a black man's election is a victory for all black people, which includes black women. And a victory for a woman of any color represents a victory for women of any color, but not men. Deciding which achieves more involves a moral calculus that will flow to whichever side is arguing at the time. We can all burrow into a rabbit hole of ugly speech about either group, but that only buries us. The problems of the previous two sections coalesce in the concept of coalition and how it elides programs of special interest. Ifill's best example of this is Massachusetts governor Deval Patrick. From a statewide perspective, he came out of nowhere to jump the line and win the governorship despite a statewide black community that topped out at 7% of the population. Patrick succeeded by advocating programs that benefited both rural and suburban populists while also promoting urban underclass interests. Economics underlines the commonality of this approach, not race, gender or machine politics. Which, in addition to some neophyte political miscues, immediately undermined him. As a black man, Patrick was expected to speak for the black political machine, despite its inability to elect him. Similarly, as an exemplar of civil rights advancement, his moving toward an economic coalition irrespective of racial or gender politics unavoidably opened him to criticism for not doing enough to promote gender or other minority interest groups. Bundling economic interests works on the campaign, but the moment you're not bundling money to one group or another, you've failed them, even if your overall bundling of monies encompasses multiple groups. Ifill seems to suggest that this type of criticism might be the most damaging to breakthrough candidates. For one, by breaking through, they offer hope to so many disparate and disempowered groups that they can't possibly achieve enough for everyone. Their success in gaining opportunity for those with so many demands inevitably sets them up for failure with those demanding. For another, by breaking through with a message that appeals to a coalition, they invariably suffer demonization at the hands of monolithic or monochrome interest groups. A black community accustomed to leaders who promoted black community legislation or acted like ward heelers for black community interests feels a sense of betrayal from a candidate who looks like them but doesn't steadily deliver funds or actions that are community-only. Much like the struggle between generations within the black community at large, this demand presents one of Ifill's "sandpaper" moments between a group's exclusive interests and an inclusive program that won't necessarily advance a social demographic over an economic demographic. Beyond the points elucidated above, Ifill's book presents some problems. To her credit, she neatly covers important civil rights events and issues from the last thirty years in a taut reporter's style. Her book also religiously cites important events and quotes. She profiles dozens of nationally recognized black leaders, while also offering mini-profiles of the up-and-comers. And she presents the divisions within the black political community with fairness to both sides. But while the reportage of civil rights events and the substantial number of citations are welcome and do the book credit, the former can't help but be a gloss, while the latter relies too much on Ifill herself. I don't have any reason to doubt the soundness of Ifill's character or judgment, but after flipping back to her notes scores of times and finding mostly citations to articles she had written, I gave up on her notes. Gwen Ifill is a good journalist and a capable analyst, but something is lost by her repeated citation of herself for events. I accord her a great deal of credit for her thinking and reporting, but in a book dominated by personal interviews and references back to one's own description of events, the self-notation approaches something like pretense. It's buttressing argument with description that might or might not have been colored by an argument she subscribed to at the time of the reporting. Even if Gwen Ifill were the pinnacle of her trade, it would do her conclusions more credit to work against evidence provided by more sources not her own. Secondly, while the profiles of black political newcomers might satisfy a politics wonk or a real civil rights junkie, Ifill's two or three pages each on a scattering of personalities reads like page-padding. Indeed, a great deal of the book reads like padding. According to Ifill, this book was in the works for a couple of years before Obama's victory, but take out the multiple references to Obama's successful campaign and the profile glosses in the final chapter, and this book probably clocks in at no more than 150 pages. Which wouldn't be a problem in itself if many of the social and political tensions examined in it weren't somewhat superficially explored in a manner that is surely quite probative in a news article but lacks heft in a book's longer form. Moreover, much of what she explores should be fairly well understood by the educated reader. The tensions between black and women civil rights activists go back nearly fifty years. The debate about the monolithic nature of the "black civil rights community," what black candidates agitate for and what direction the NAACP will take, is also at least two decades old. Ifill repeats her reports on Jesse Jackson's 1984 and 1988 campaigns and later comments on how divisive a figure he can be among advocates of modern coalition politics within the black community, but she refrains from commenting on the criticism he received when running in both '84 and '88 on the idea that any issue was a civil rights issue. She describes the generational debate as more novel than it is, exploring it through an Obama context that really isn't necessary. Jackson's ideological rigidity was a problem and debate topic long before Obama, but it doesn't seem to fit the timeline that Ifill effects. Once you take away the slim profiles of many black up-and-coming officeholders, you are left with slim profiles of major officeholders. Deval Patrick has been profiled numerous times and with fuller treatment than Ifill offers, and the New Yorker covered more ground on Cory Booker a year ago than Ifill does. As expected, Obama was covered almost exhaustively before election day, leaving Ifill's book little room for trailblazing, which she doesn't attempt. Remove the profiles, and you're left with her observations about division within the black activist community and within coalitions seeking change on behalf of marginalized groups. These are things you should already know. Gwen Ifill is a good and thoughtful journalist, and her book covers core issues facing the black community as it progresses from an agitating pose to a more assured position within all levels of government. But her book processes broadly understood contentious issues through a reductive metaphor (sandpaper), presents broad and superficial biographies that don't always link up with her ideas, and gives scattershot political profiles of new politicians that will only achieve significance if they're borne out years down the road. Her book offers a good education to those ignorant of the issues facing black activism. But anyone familiar with the subject will find its survey treatment unfortunately thin. Recommended for politics wonks who want to know more black candidates and but who might have missed fuller coverage of them in other media or books. Not recommended for those interested in a history of black civil rights politics, as Ifill's historical asides are meant to inform present issues, not probe historiographical divides. Not recommended for those who want a detailed breakdown of the last election. Ifill highlights important currents in the black political community and also the stresses amongst racial or gender interest groups, but her conventional observations and glib descriptions better fit the short form of daily journalism than the deeper confines of book-length text.